Preheat oven to 450 F and prep pot with water to cook pasta according to directions on package. Place zucchini, bell pepper, tomatoes, rosemary and garlic on a rimmed baking sheet (lined with parchment paper, optional). Coat with cooking spray. Sprinkle with salt and pepper; toss and spread out evenly on baking sheet. Roast , stirring once, until tender and vegetables begin to brown in spots, approximately 15 to 20 minutes. 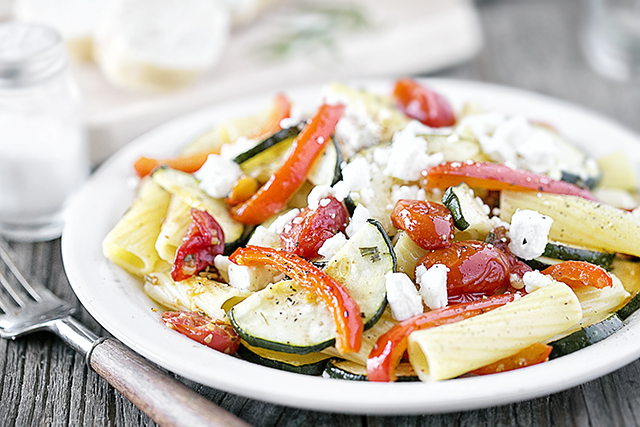 Toss vegetable mixture with pasta and sprinkle with feta. Serving size is 1 cup cooked pasta, 1/2 of vegetables and 1-1/4 Tbsp crumbled feta cheese. 6 SmartPoints per serving.